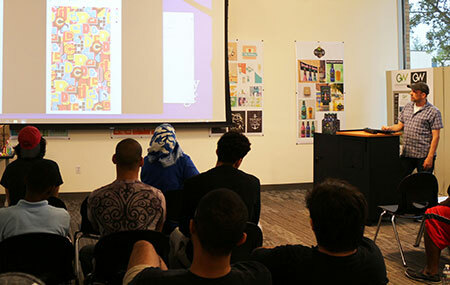 Photo Caption A: Graphic designer and fine artist Greg Lamarche addresses Berkeley College students during a career-focused speaker series arranged by the Berkeley College School of Professional Studies on July 17, 2017, in Woodland Park, NJ. 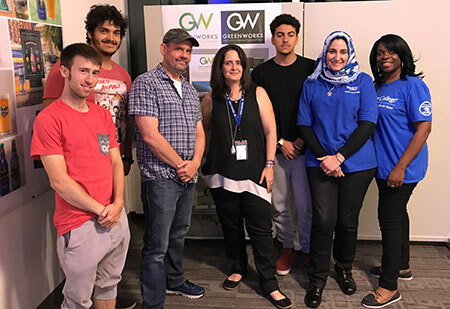 Greg Lamarche, renowned for infusing graffiti styling into graphic design work and art collages, shared insight into his artistic technique and passion for his career when he addressed students at Berkeley College in Woodland Park, NJ, on July 17, 2017. Mr. Lamarche’s presentation, held in The Gallery at Woodland Park, is part of a speaker series established to provide students opportunities to interact with successful practitioners in the graphic design field. The series is arranged by the Berkeley College School of Professional Studies. Born and raised in Queens, NY, Mr. Lamarche started creating collages and writing graffiti in the early 1980s. From 1992 to 1995, he published the graffiti magazine, Skills, while living outside of Boston. Since 1999, he has been working as a fine artist, graphic designer and illustrator. His most recent design projects include collaborations with Converse, Facebook, J. Crew, Shake Shack and Bloomingdale’s. Mr. Lamarche’s collages have been displayed in galleries around the world, with site-specific murals in Brooklyn, Miami, Venice and London. His artwork has also been featured in numerous books and publications like Juxtapoz Magazine, Print Magazine, The New York Times and The History of American Graffiti. At the end of his presentation to the students, Mr. Lamarche shared a photo of a graffiti sketch from a notebook, one of his first attempts at lettering while in middle school. He explained that he never envisioned that sketch would lead to a thriving career in design. “Hopefully that sketch gives the students motivation to continue pursuing their dreams in the creative industry,” Ms. Hutchinson said. The next speaker in the series held at The Gallery at Woodland Park will be integrated and digital marketing expert Anna Ross on July 24, 2017. Photo Caption B: Graphic designer and fine artist Greg Lamarche (second from left) meets Berkeley College students and faculty after presenting as part of a career-focused speaker series arranged by the Berkeley College School of Professional Studies on July 17, 2017, in Woodland Park, NJ. Also pictured (L to R): student Rocco Ditaranto from Paterson, NJ; student Hanzel Escorcia of Fair Lawn, NJ; Nancy Fischer, Professor, Graphic Design, Berkeley College School of Professional Studies; students El-Mehdi and Amal Bendriss of Belleville, NJ; and Julia Hutchinson, Professor, Graphic Design, Berkeley College School of Professional Studies. A leader in providing career-focused education since 1931, Berkeley College is accredited by the Middle States Commission on Higher Education and enrolls more than 8,000 students – including more than 550 international students – in its Master’s, Bachelor’s and Associate’s degree and Certificate programs. Students can study in more than 20 career fields. Berkeley College is comprised of the Larry L. Luing School of Business®, the School of Professional Studies, the School of Health Studies, and the School of Liberal Arts. The School of Graduate Studies offers an MBA in Management online and in Woodland Park, NJ. Berkeley College has five New Jersey campuses – Dover, Newark, Paramus, Woodbridge and Woodland Park. In New York there are three campuses – Midtown Manhattan, Brooklyn and White Plains. Berkeley College Online® serves a global population. For four consecutive years, U.S. News & World Report has named Berkeley College among the Best Colleges for Online Bachelor’s Programs and among the Best Online Bachelor’s Programs for Veterans. The website address is www.BerkeleyCollege.edu. Jay Arthur, Berkeley College student, has created fashionable designs.